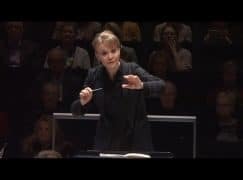 I once saw Susanna Mälkki conduct a concert made up entirely of world premieres by unknown composers. It was in Stockholm, and very bracing, too. The audience was small, but curious. Never in my wildest dreams did I imagine that a US orchestra would invite Susanna to repeat the feat – a concert made up of nothing but new sounds without a single familiar name on the billboard. And not one American. That’s what the Los Angeles Philharmonic has just done. Never in your wildest dreams? That programming sounds like typical Susanna. The Century isn’t over yet. Wait for even more challenging stuff (music?) being programmed by composers from out of space …. I believe all 17 people in attendance are going to be RAVING on social media afterwards about the amazing, mind-blowing concert they just heard. Hopefully they can also get selfies with Susanna. Audiences can choose. Spare a thought for the band ! It’s a great curiosity of the music world that, in circumstances like this, the fearless/intrepid/bold etc conductor is the one who gets all the credit for taking on a programme like this. The ones who are really taking a risk here are the funders. The same is true of how (to name the most famous example) Simon Rattle built what was championed as a ‘progressive repertoire’ in Birmingham – by getting huge financial backing to promote an idea. If a conductor is prepared to give up their fee and find any other extra funding, then they can be given as many plaudits as they like. Until then, can we have more praise for those who back projects like this? Sure, the conductor has to learn the works and deliver the goods, but at least they still get paid for doing something they love. As the conductor and long-time anxious bean-counter of an amateur orchestra, I’d love to do programmes like this; but frankly there’s more chance of me shacking up with Pippa Middleton than there is of my band being able to risk an empty house on a programme of new stuff. But isn’t being a charismatic conductor as much being able to charm the heavy hitters as actually conducting the orchestra? Even the biggest names still have to schmooze the doners even when they have hit the heights of their profession. A sad but true fact of artistic life unless one is born wealthy. Er…not really, no. And it’s an awful lot easier to charm donors when they are all very rich and predisposed to donate anyway. This is far more a part of American orchestral life than it is in the UK. Many conductors are hopeless at this sort of thing. That’s why big orchestras employ an army of fundraisers. Put it this way: if you think Robin Ticciati or Daniel Harding are capable of charming money out of a hard-nosed chief executive who doesn’t really like music, you’d be mistaken. It takes a pro to extol the virtues of brand awareness, community outreach yadda yadda, with anything like the degree of conviction and persuasiveness that’s needed to make it work. A top-level conductor won’t get near a donor unless it’s either a) once they’ve already donated or b) are at the business end of the process having been worked on, sometimes for years, by the fundraising team. If a donor has got that far the conductor comes along to do the ‘stardust’ bit, not the nitty-gritty of persuading them to donate. Well it’s obviously not worked for YOU! What an odd thing to say. My point is simply that it’s relatively easy for conductors in big organisations to do this stuff as they have big donors with open minds and a huge machine to do the legwork. As it happens I’ve just secured funding for the first Mahler 2 in my city for 15 years, so with the greatest of respect, I should stick to commenting on matters of which you have at least a modicum of knowledge and experience. Well, I’m NOT impoverished and I’ve played more Mahler 2’s than you’ve had hot dinners! Come back when you’ve made a name for yourself and have made something out of yourself. (By the way, Schubert’s ‘Unfinished’ Symphony is much more difficult to conduct than Mahler 2. Don’t take my word for it – try reading Simon Rattle’s biography by Nicholas Kenyan). But isn’t being a charismatic conductor as much being able to charm the heavy hitters as actually conducting the orchestra? Even the biggest names still have to schmooze the doners when they have hit the heights of their profession. In fairness to Mr Lebrecht I note that he does say that he’s surprised that a US orchestra “would invite” Ms Malkki to do this – which at least suggests he’s aware of/realistic enough to consider the funding risk involved, unlike many arts journalists. I am having trouble thinking of an Amerian composer. It’s a nice place to visit for its architecture and art, however. But good for the LA Phil for being brave. It should keep ticket prices low to encourage the curious. Ameria? I think it’s near Nambia. I have a feeling that the LA Phil audience is a bit more used to contemporary music than many others in the US, since E-P Salonen did a lot of new music during his tenure there. Correct me if I’m wrong. No, it was started under the leadership of executive director Ernest Fleischmann in early 1980s – about a decade before EPS’s arrival in LA as a music director. And in fact, this concert is part of the Green Umbrella series, which has always been separate from the Philharmonic’s regular subscription series and is in its 30th season. GU concerts, which feature the LA Phil New Music Group and guests, are expressly a forum for new or very recent works, though they’re now held in Disney Hall instead of the smaller offsite venues of earlier years. I might read a bit deeper and learn more about LA’s programming before heralding this as an unprecedented event. First of all, this was not a subscription concert, but part of the LA Phil’s “Green Umbrella” series, which is entirely devoted to new music. Secondly, these appear to be works for large ensemble, not orchestra – it is the “LA Phil New Music Group” performing, not the LA Philharmonic. A great collection of works and composers, to be sure, but not an orchestra concert, not on a subscription series, and with a Principal Guest Conductor, not just a one-off guest conductor. The rest of the recently-announced season perhaps far more noteworthy than this individual concert? Green Umbrella is a subscription series! This Malkki concert will be part of our Phil’s “Green Umbrella” series of new music programs. The audience will be small (but only by Phil standards): over 1,000 ticket buyers will be there for each program. The top balconies and the seats by the organ pipes are closed for performance, making WDCH more intimate in feeling. Yes, the ticket prices are lower than average, but that’s because the musicians are chamber-sized in quantity. The ticket prices are also lowered for the chamber music series. The Green Umbrella series consistently introduces composers to the LA audience; having five premieres in a single program is a special treat. The real impetus for the Green Umbrella series (and for Disney Hall and for a top-rank orchestra) came from Deborah Borda’s major predecessor, Ernest Fleischmann. But is there any information about attendance at this concert? You will have to wait until November for that information. Some women will be in attendance. Also, there will be some men. Four children under age 13. One comfort peacock. Also, Yuja Wang. Orchestral Concert Music is dead when we have to debate the legitmacy of a concert comprised of new works by unknown composers. New Music is mostly a one-performance affair because there is no secondary medium available to promote works after a premiere. Radio rarely broadcasts recordings of new music and receives perhaps the least amount of press attention. Additionally contemporary works are almost never included in most college curriculuum, and certinaly the classical tradition built on the “Standard (Rep)eratory” mindset has harmed new innovation. The world of contemporary concert music is better explored in chamber music and more interestly band music. Wind symphonies perform new works all the time because the concert band has no classical tradition. There is no standard rep. And that might be a more-welcoming environment for composers and listeners to explore. No Slipped Disc article required. I wholly agree with your first sentence. Yet I believe orchestral music, and “new music” in general, was killed from the inside, by a few loud totalitarian ideologists (some with a Nazi past, Adorno for example) who imposed a public-repelling anti-aesthetic as music, eventually leading the majority of public and artists to associate “new works” with an unintelligible gallimaufry of noises. The result is that new works are being ever harder to present. Leo, I fully agree with your well-considered comments and think you got right to the core issue. Composers stopped respecting their audiences and tried to instead convince us that their (failed) experiments were instead musical progress, and we (the audience) are just too stupid to understand the difference. There are probably people who write relevant, enriching music today that is worth hearing and will be for millennia to come, but I’m not sure who they might even be. I am aware of no one living, or really in the second half of the 20th century, whose name and musical output will join the ranks of Beethoven, Bruckner, Brahms, Schubert, Shostakovich, Schumann, etc. Can anyone name a single living composer whose body of works will stand the test of time? (and please, spare us by naming Elliott Carter or any of his fellow atonal pygmies). Leo mentions that Adorno had a Nazi past but this is patently untrue, and not a charge to throw around liberally. He lost his teaching post due to the Nazis, and he was himself part -Jewish. He also coined the famous remark that no poetry is possible post-Aushwitz. Around 1933 Theodor Wiesengrund Adorno published praising reviews of recent musical works, some set to texts of Baldur von Schirach, praising them as “the steely romanticism our nation now needs” (similar terms were used by Goebbels). After the war, when Adorno was already publicly supporting the musical avant-garde, a reader’s letter was published by the Frankfurter Allgemeine Zeitung – citing the aforementioned review in full and requesting Adorno’s reply, in light with his more recent positions. His reply was: “I hope the quantity of my recent work will outweigh my previous deeds”. I am happy you, and others, share my opinions. Let’s hope someday it has a real effect, and change, most neededly in public opinion of new music, will happen. The problem is not so much the adventurous experimentations themselves, as much as them being presented INSTEAD of new music, making it impossible for composers of MUSIC to reach large audiences – or even earn a living. Before the new “new music” came about, successful compositions were commercial successes as well. Yet thanks to “new music”, this is part of the past now. Maybe that is why great composers went extinct. Too threadbare to constitute ‘Nazi past’ as regards Adorno. Schoenberg made grandiose claims about guaranteeing the supremacy of German music, but it would be similarly disingenuous to ascribe your label to him. (1) Good on our host for highlighting this concert. When he linked the other day to the full LAPhil season, which will feature 54 commissions and something closer to 60 world premiers, a large number of commenters fixated on the only name they recognized, John Adams, as “proof” that the orchestra is relying on over-the-hill hacks. This concert program makes it harder (although probably not impossible) to be so obtuse. (3) The LAPhil programs new music way more than other large American orchestras, and more so than most orchestras anywhere. The 2018-19 100th-anniversary season got attention for its 50-odd world premiers, but the current season has 22. Which means that on most weeks when he’s in LA, Dudamel is conducting a world premier. (4) The stylistic diversity among the musicians tapped for commissions is remarkable — Tan Dun, Unsuk Chin, Kamasi Washington, Billy Childs. (And, again, four dozen others.) But there will still be plenty of nights when the standard orchestral repertoire gets close attention. Brahms, Sibelius, Stravinsky, Haydn, Beethoven and plenty of others. It’s not like Europeans from more than a century ago have been banished. The reflex from a lot of people on this board is to treat every single bit of news as evidence of a continuing cultural catastrophe. Maybe not every single bit of news is that. This is just one of five different programs in Green Umbrella series next season presenting nothing but LAPhil-commissioned world premieres – about two dozen of them. These concerts are usually well attended by over 1500 enthusiastic listeners. Perfect … the conductor could totally screw up while the musicians could play numerous wrong notes and no audience would know. Of course, nobody could get away with this consistently, so this is for special occasion only. Well the “new music” scene has been getting away with this consistently for the past 70 years. And that’s exactly why almost nobody wants to hear or perform new works anymore. See my comment above. Conductors screw up all the time. Didn’t anyone tell you? I know … but pieces of certain genre allow way more room to screw up than others, don’t you already know that? Are you now discussing opera? Not necessarily. It depends on the nature of the music, the competency of the conductor and the sophistication of the audience. IMHO a music piece is like a maze. You start, you are “guided” into the journey/exploration thru sound, then you come to a satisfying conclusion. The mazes started simple, then, more unexpected twists and turns, romantic elements, surprises, impressionism, colors, etc. They are getting larger and more complex. Then came a fellow called Schoneberg who felt he could build better mazes than Wagner by blowing holes everywhere thru the walls of the mazes. Sorry folks, there is no more specific path. You could technically wonder in any direction in any way you want. Wait, being a German, there gotta be a system for that structure to be understood and analyzed. So there comes the 12-steps system. You must pre-define how you walk serially every 12 steps you made: Like, 1st step left by right foot, 2nd step left by left foot, 3rd step forward by left foot, 4th step right by right foot, 5th step right by hopping both feet, … and so forth, to make your exploration “having an order” again. Yeah eventually, if the maze is artful, you would find your exit and you wouldn’t get real upset by it. Compositionally overly complicated, sonically numbing, but at least the composer could say “it adds up mathematically”. So here we are, new music! My opinion, not popular here, is that Artificial Intelligence will build the better maze and create your ‘new music’. And it will be popular. (By definition. That’s how evolution works). And it will be wonderful. And it will be ignored by some denizens here. while the world moves on. Didn’t some chap called Beethoven do a four-hour concert of unknown avant-garde music in 1808? Nothing new. Didn’t some chap called Beethoven do a four-hour concert of unknown avant-garde music in 1808? He was a good improviser as well. As it turns out Oliver Knussen and Joseph Kalichstein put together a similar program in 2009 – during the jaws of the Great Recession – with the National Symphony Orchestra. If my memory was correct, this was offered as part of the subscription, or perhaps as an add-on option. But it was performed by the NSO, not a contemporary music ensemble. So, although rare, nothing new here. In fact events like these also occurred during Mehta’s tenure with the New York Philharmonic. And doesn’t the NY Philharmonic have its own new music series – or it had when Alan Gilbert was MD? If there is “nothing new here”, then please let us know which other major symphony orchestra anywhere has ever scheduled an entire subscription series of five different programs that consist exclusively of nothing but about two dozen world premieres, all of them commissioned by the orchestra and performed by its musicians. The original topic of this thread was about a single concert that consisted entirely of contemporary music. I pointed out that, although rare, this is not unusual. Also, as someone pointed out, the concert that the thread originally referred to was part of Los Angeles Philharmonic’s “Green Umbrella” series, which features the Los Angeles Philharmonic’s New Music Group, not the orchestra. As to your question of what other orchestra has schedule all new music subscription series, the New York Philharmonic under Alan Gilbert is an obvious answer.